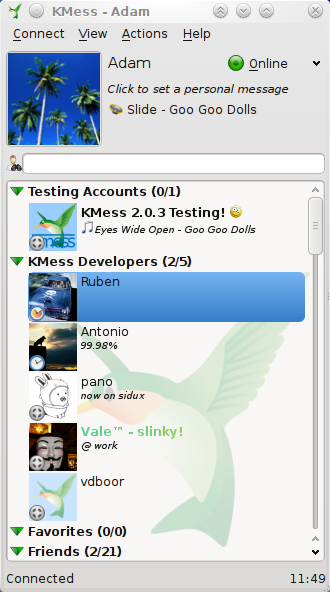 « KMess 2.0 beta 2 is out! 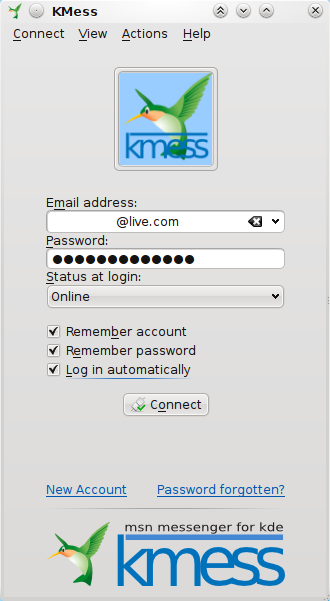 I like KMess, but there are more features missing. @Sammy: you could have seen it from the screenshots (chat app) and the website was being linked to as well. 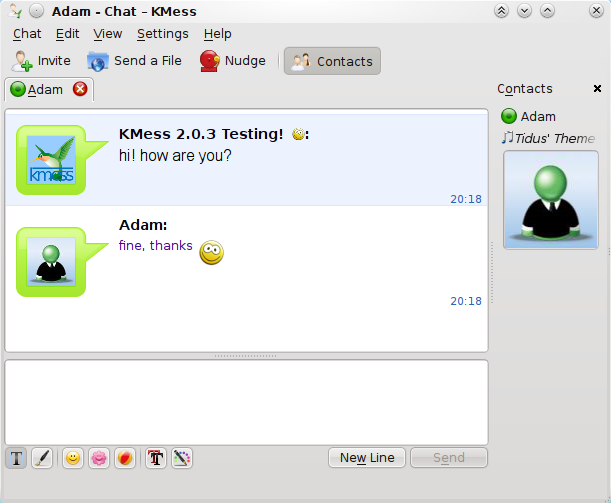 But fyi: it’s a MSN/MS Live Messenger (or whatever they call it these days) client. Thank you for your hard work, you and all the kmess team ! You should seriously consider moving the visual guide to Userbase to increase discoverability. Thank you for your hard work, and we waiting webcam support in the 2.1. Thank you for developing the best free MSN client. I’ve been using since it was alpha and it’s amazing. The error report system has been very useful and the program is beautiful, easy to use, starts quickly, is stable and works perfect. What about integration with Kopete? This is a great piece of software! 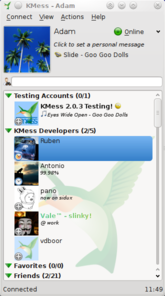 If you use MSN messenger protocol, I recommend that you use this client instead of kopete. About the icon, you should consider asking the Oxygen team for a nice icon and maybe other visual stuff. This is on pinheiro’s itch list as well.. 😉 He likes to redo our icon, and I’ve been told the hummingbird is quite hard to do right. So, at the moment we use this icon instead to have a reasonably nice oxygen look. hello, I have tried Kmess2 today and for the moment, is my new IM, replacing emesene, unfortunately, there are features missing but the program is amazing. I wish somes features like, best integration with plasma, audio/video support, and more customization. Thanks from Argentina. Thank you guys, you’re awesome. Ops! And to say that I always complain that people on the planet talk about their stuff assuming the readers know what it’s about…. I will take more care for the next posts, I promise! Amroth, Sorry for my bad english. I would say something like http://www.notmart.org/images/plasmoidsystray.png in the system tray icon. Also, the notifications aren’t working very well, thanks anyway. @POl: That could be an idea for the future, indeed About the notifications, lately on KDE4.3 they’re behaving somehow badly, but it’s KNotify’s fault, if you try it on 4.2 they should work correctly! @Diego: Yes, as soon as we will have a decent Windows build! I just created a Slackware package, but it’s made for my hybrid system (i.e., Slack 12.2 with KDE 4.2.2 on top of it), so it won’t be useful… yet. That will surely change when Slackware goes 13.0. Meanwhile, you can have my SlackBuild should you like it. This is an excellent MSN client. I am using it right now, and I am having trouble selecting another program for my Jabber client (because I don’t want a multiprotocol one anymore) kudos! We’d also love to have a Slackware binary package too; could you do a good one for us? Or, do you know if any big repo is hosting a KMess 2.0 package already?